Not long ago, I told you about a sidewalk bill that passed through Metro Council. Nashville needs more sidewalks. I don’t think any reasonable person would argue about that. The bill was complicated and intended to make developers pay for new sidewalks in areas where there were none. And like many reactionary bills, Metro Council did not take the time to project the total impact this bill would have on Nashville. Since the law took effect on July 1st, we’ve already seen the first unintended consequence rear its ugly head. You might have seen this story in the news over the weekend. Jennifer Jones has lived in Edgehill for many years. She wants to retire and live in the neighborhood. The only way she can do this is to build a small cottage (as a retirement home) behind her current home. She has been working on this for three years with her contractor and just refinanced her home to free up $80,000 to build the cottage. With the new law, she will be required to rip up the old sidewalk in front of her home and replace it with a larger sidewalk at a cost of $70,000. Almost doubling her project costs. In addition, the larger sidewalk will cause her to lose more of her yard and the landscaping that she has in place now. We were told during the debate over this bill that it does not apply to homeowners, only developers. And why it’s important that you and I are involved in the actions taken by Metro Council, especially when they get in a hurry to pass a bill. 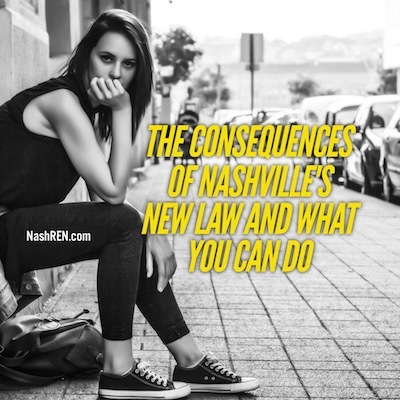 I promise to be involved in the effort to change this bill so that it works for all of Nashville and doesn’t require us to do dumb things. Like spending funds to tear up perfectly functioning sidewalks, instead of building more in areas where they are needed. Or, prohibitively increasing the cost of new construction so homes are not affordable. If you want to help protect your property rights, hit reply and let me know. I’ll make sure that your voice is heard and that there is a place for you at the table. The Daily Deal in Nashville is a historic home in the Nations [West Nashville] that needs work and is listed for less than $210,000.